I already a few hours wandering, but couldn't figure it out — how do I change an Outline Numbering format? E.g. in the picture you could see a button «Format» — it allows to choose between various "Untitled" styles. For some reason for convertation process that I am doing it being dropped to an unknown value, so I need to get it back. So, how do I set the current «OutlineNumbering» to e.g. "Untitled 1" with UNO API? I found various properties with MRI that mention in various ways the word "numbering", but nowhere mentioned e.g. "Untitled 1" when it being set, or at least something resembling. First paragraph, property NumberingStyleName = "Untitled1"
No, that doesn't work ☹ I just tested it in MRI — set the Property Value "NumberingStyleName" to "Untitled 1" in the first paragraph; however when I go to «Tools → Outline Numbering…», I can see that numbering doesn't seem to be changed. But I can choose there «Format… → Untitled 1» by hand, and I see that then number style changed. Anyway, why would the outline numbering for the whole document be set in the first paragraph? UPD: or perhaps what the Office actually does after one chooses the option — is just iterates for every paragraph and changes the value? Hi-Angel wrote: No, that doesn't work ☹ I just tested it in MRI — set the Property Value "NumberingStyleName" to "Untitled 1"
Are you sure its "Untitled 1" and not "Untitled1" without space? 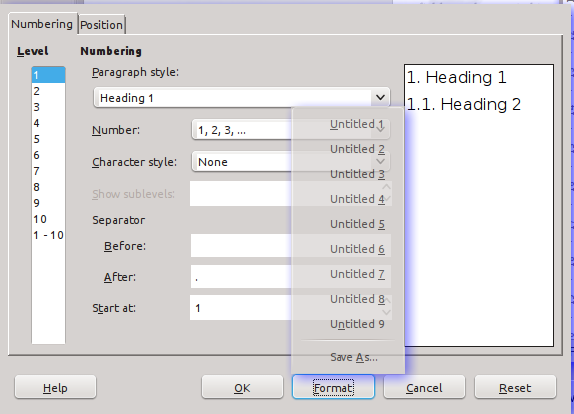 Hi-Angel wrote: Anyway, why would the outline numbering for the whole document be set in the first paragraph? Because I set it up this way for testing. Villeroy wrote: Are you sure its "Untitled 1" and not "Untitled1" without space? Yep, you can check it with the screenshot of the first post. I need to say that actually the style of the first paragraph indeed seems to be changed — I could inspect the change with MRI. But I wanted to make a global change (like the option «Tools → Outline Numbering…» does), and it doesn't work this way. I think however if UNO API has no an according method, I could indeed just iterate through every paragraph. That would be sad a bit, though. Okay, I made a script that saves some properties to a file. """First arg is an opened file to write, the second is the property owner"""
except Exception: #uno.RuntimeException: wtf, why can't I handle it? Next I made a simple test document, and wrote its properties before and after the «Outline Numbering» was changed. The interesting thing is that «NumberingStyleName» haven't changed — it was always set to "Outline" in some paragraphs. In fact after I compared files with vimdiff, the only thing that changed besides of [word,char] counters and ids — is the «ListLabelString»(just a string of heading counter). But the script doesn't write all existing properties, though, I think I am missing something. I wrote a function to print recursively all properties for some maximum level (it also checks that it doesn't go into the same location where it was). Use like printUNO(myDocument, , 5) Still I didn't found anything changed after a global change of OutlineNumbering (except of things like id's, characters counts, etc).